The race is on to reach the top of the Wash100 rankings before voting ends on April 30th. With the deadline drawing near, there have been some surprises over the last two weeks as the GovCon community continues to select their favorite executives. A shake-up occurred in the rankings to keep Wash100 voting red hot. After surpassing Mac Curtis of Perspecta and surging into first place last week, Tiffanny Gates of Novetta had another strong week and remains the top vote getter by a wide margin. David Wajsgras of Raytheon kept place in the top three for the last few weeks, but he received enough votes this week to reach second place surpassing Curtis, who now occupies third place. 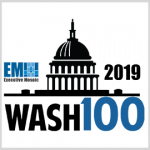 Steve Harris of Dell EMC Federal had the strongest week with 284 votes to sneak into 10th place. Jill Singer and Xavier Williams of AT&T held their positions at fourth and sixth place, respectively. Tony Moraco and Nazzic Keene continue to represent SAIC strongly in fifth and seventh place. Teresa Carlson of Amazon Web Services remains in eighth place for the third consecutive week. John Harris of Raytheon continues to hold ninth place, and Thomas Kennedy of Raytheon, Marillyn Hewson of Lockheed Martin, Gwynne Shotwell of SpaceX, Leanne Caret of Boeing, Michael Corkery of Deltek and David Levy of Amazon Web Services continue to be threats just outside the top 10. 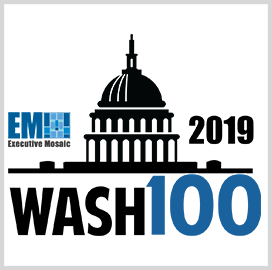 With just a couple of weeks remaining for the GovCon community to vote, over 10,500 votes have been cast for the top 30 executives. It’s clear that no spot is safe, and more changes are coming for the Wash100 rankings. Don’t forget to vote for your GovCon executives before April 30th.